Been there, done that - those are Robert Plant's feelings about another Led Zeppelin reunion. Yesterday the singer said that he was at at age in his life where big-deal rock tours held little interest for him. 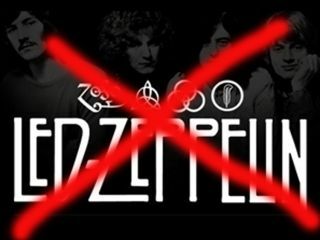 However, he was quick to point out that he remains on good terms with guitarist Jimmy Page and his decision not to tour with Led Zeppelin has caused no animosity between the two. "I still see Jimmy quite a lot and he's very complimentary and supportive of what I'm doing," Plant said in an interview broadcast on BBC Wales. "But we are in different places now and you have to go on to do different things." For Plant and Page, those other things are a study in contrasts. Plant is planning to cut another album with bluegrass artist Alison Krauss - their successful Raising Sand record has netted five Grammy nominations. "I'm doing very well with Alison and I'm enjoying that," the singer said. As for Page, he's still committed to recording an album and touring with John Paul Jones, Jason Bonham and a yet-to-be-named lead singer. Many vocalists have been floated for filling the void left by Robert Plant, but the heavy Vegas odds favor Alter Bridge singer Myles Kennedy. All of which means one giant Christmas lump of coal for millions of music fans around the world: a Creed reunion.